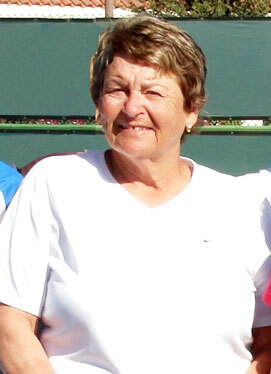 Retired high school math teacher Sheila Pearl Johnson has film makers interested in her story after returning to collegiate tennis at 60 and helping Grand Canyon into the NCAA Division II West Regional here this week. This is old school ... literally. At 60, Sheila Pearl Johnson is the oldest tennis player in the collegiate ranks. She also has the best singles (13-5) and doubles (9-10) records for Grand Canyon, seeded seventh in this week's NCAA Division II West Regional at the Patsy T. Mink Central Oahu Regional Park tennis courts. Prior to this season, Johnson last played collegiately for Arizona State in the mid-1960s. With one year of eligibility remaining, she has helped the Antelopes turn a 1-10 program into an 8-8 regional qualifier. There's even talk of a film chronicling Johnson's life, a retired high school math teacher who went back to college to play one last season. "It's hard to believe that anyone would be that interested in my story," Johnson said. "I've played competitively my whole life. This really was the perfect storm for me to do this, might have been the only year that it would have worked." The Antelopes face No. 2 Hawaii Pacific tomorrow for the right to advance to Friday's final. Friday's winner goes on to the NCAA Division II round of 16 and "who would have thought that would be possible," Johnson said. It was a groundstroke of luck. How else to explain 60-year-old Sheila Pearl Johnson's presence on the Grand Canyon University women's tennis team this season? Johnson, some 40 years removed from her previous collegiate competition at Arizona State, has helped the Antelopes qualify for this week's NCAA Division II West Regional. GCU, seeded seventh, faces host and second-seeded Hawaii Pacific tomorrow in a semifinal at Patsy T. Mink Central Oahu Regional Park's tennis courts. Johnson, with team-best records of 13-5 in singles and 9-10 in doubles, will be at No. 5 singles tomorrow. That the 'Lopes have qualified is impressive, turning last season's 1-10 record into 8-8 this year. That Johnson is part of the turnaround is nothing less than remarkable. Her first trip to Hawaii is the culmination of what she calls "the perfect storm," a combination of circumstance, coincidence and just plain luck. At Central Oahu Regional Park: Cal State Los Angeles vs. Hawaii-Hilo, 11 a.m.; Hawaii Pacific vs. Grand Canyon, 2 p.m.
At Brigham Young-Hawaii courts: UC San Diego vs. Cal Poly Pomona, 2 p.m.
At Central Oahu Regional Park: Regional final, 2 p.m.
At Brigham Young-Hawaii courts: UCSD-CPP winner vs. Brigham Young-Hawaii, 2 p.m.
Hawaii Pacific vs. Sonoma State, 11 a.m. First-year GCU coach Greg Prudhomme had an open roster spot. Johnson, a nationally ranked seniors player taking private lessons from Prudhomme, had one year of college eligibility remaining. "It's been quite an amazing year for us," Prudhomme said. "I was faced with the daunting task of turning around an ailing program and was hired three weeks before the (fall) semester started. "We had no players at that time. All I was trying to do was fill the roster, have six players. We went into spring one player short." Enter Johnson, who had been taking private lessons from Prudhomme at the Paseo Racquet Center, part of his family's tennis business in Glendale, Ariz. When told that Prudhomme had to stop giving lessons because of his new coaching job, Johnson told his parents who work in the pro shop, "I've got one year of eligibility left and I could get my lessons that way." "I knew how good she was," Prudhomme said. "She's ranked No. 3 in her age-group nationally, has a ton of experience. I had one scholarship left and I offered it to her." Johnson has been featured on the CBS Evening News and National Public Radio, and in Sports Illustrated and USA Today. Her inspirational story has a potential book deal in the offing as well as a movie. Atchity Entertainment International is tossing a film deal her way -- after the season is done because of NCAA rules -- with Meryl Streep, Diane Keaton and Kathy Bates being suggested to play Johnson. "I would like Steffi Graf to play me, she's my favorite player," Johnson said. "But I have heard that Diane Keaton does play tennis, so that would be OK."
Prudhomme is holding out for bigger names. Since AEI has made films that have starred Angelina Jolie, Prudhomme thought it a no-brainer that Jolie's husband -- Brad Pitt -- should play him. Sheila Pearl Johnson played at Arizona State 40 years ago. "Actually, I'd be flattered for anybody to play me," Prudhomme said. "But this is about Sheila and it's a great story. You have to start digging back to find sports movies that have a good family message to be sent. "We weren't into it for the publicity. It's great to be able to show that tennis is a sport for a lifetime. And hopefully it inspires people who don't even play tennis or are active to get out there, go back to school. You're never too old to learn. That's what impresses me about Sheila. She wants to get better." Johnson, who already holds two degrees -- a bachelor's and master's -- is working on her second bachelor's, this one in Recreation and Health. The retired high school math teacher has three A's this semester and, with one grade yet to be posted, is hoping for the perfect 4.0. Her style of tennis is literally old school, reminiscent of a Billy Jean King or a Chris Evert, consistency and placement rather than power. Prudhomme said he's helped Johnson modernize her game, adding swinging volleys and being more aggressive at the net. And after this week? Johnson will continue to play in USTA senior tournaments, possibly return as a volunteer coach at GCU and recruit for Prudhomme. "I've already given him a name of a 40-year-old who is pretty good," Johnson said. "And I want to go back and work with the girls. They've been so welcoming from the first day. "When they asked me why I was doing this, I told them I just wanted to keep getting better." Regardless of how the 'Lopes do this week, Johnson said nothing could beat the past few months. 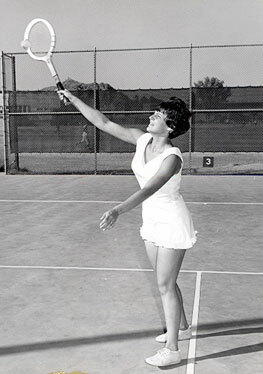 When playing for ASU in the mid-1960s, there were no dual matches, not much travel and she was not chosen to play in the prestigious Ojai Valley (Calif.) Tournament. Forty years later, Johnson has been able to enjoy being a student-athlete, including playing in the 108th Ojai tournament last week. "I'm achieving more this year than I did in three years at ASU," Johnson said. "I wish I had another year. It's going to be sad when it's over. "It's been such a great experience. Everything has just worked out." For Prudhomme, it's been a win-win situation. "In the beginning, there was a bit of disbelief," he said. "The neatest thing is when you hear what the other coaches say about her, the respect they have for her. "Like Dan MacDonald from Mesa State told his players, "Take her seriously because she's damn good."